Bad news -- it's 2015, still no hoverboards. Good news, this high-end scooter is pretty dope. "Tested" is our column where we check out new goods and services. We see if they're worth you're time and money so you don't have to. 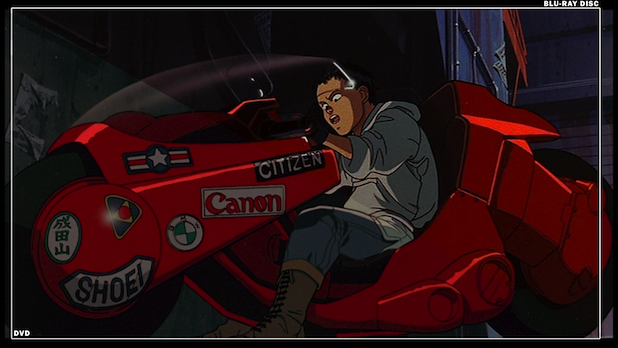 When our photographer Aleksander pulled up to the SmartShanghai office on his new scooter, I felt like Tetsuo in Akira, admiring Kaneda's bike, like, "Ceramic double-rotor two-wheel disk drive!" 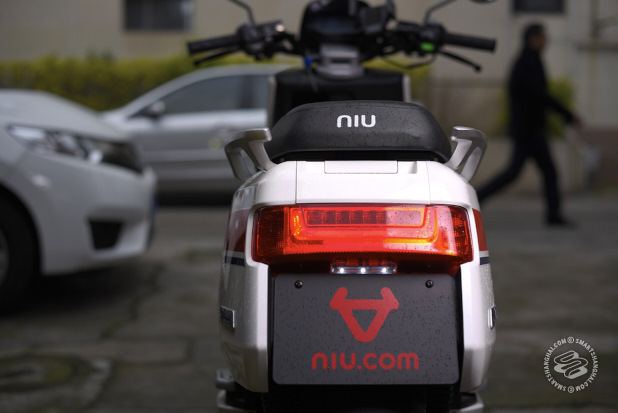 The Niu -- a new scooter by a new Beijing startup -- looks more like a smartphone remix of a Chinese scooter than that futuristic red bike in Akira. 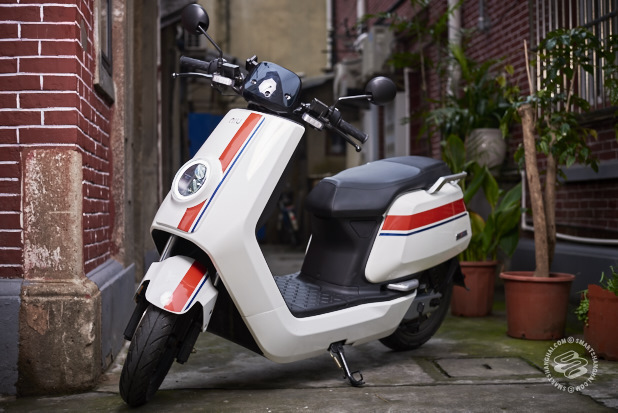 At 5000rmb, the Niu is on the higher end of the Chinese scooter market, but despite some minor issues and room for improvement, its acceleration, battery life / weight, features, and tech-integration justify the price, IF this bike can survive a few years on these Shanghai streets. Niu means bull, but also means badass / awesome (hence the slang term Niu Bi). In an interview with Bloomberg, Niu CEO Li Yinan said, "Our ancestors worked on the backs of buffaloes…Now we want to have young people get back on ‘Niu’ and see it as a cool icon.” Li is pretty niu -- dude started university at age 15, later became the youngest vice president of Chinese tech giant Huawei, then joined Baidu as their Chief Technology Officer. Part of his motivation for starting Niu is environmental; everyone in China wants a car, and many view bipedal transportation as something for the lower classes: Ayis, deliverymen, families of four sharing one bike. So with 50 million USD in startup cash (most coming from venture capital), Li set up Niu, hired a 70-member staff, including people with experience at Xiaomi, Honda, LeTv, Huawei, and Apple, and released the first bike a few months ago (and this TRON lookin' promo video). Weight: Heavy. Would take two-three people to carry it, but the battery is light -- it's only 10kg. The nice bit about its heft is that two heavier dudes (~90kg) can ride on this totally comfortably, without feeling sketch at all. Battery Life: In our experience, it takes five hours for a full battery charge. Now, they say the bike can go 100km without another charge, but that does not account for driving style. They calculate this based on 20km/hr with no stopping. Yesterday, our photographer (who has a more wild driving style) started with a full battery charge, and by 50km, was down to 15%. At 15%, the Niu will limit the top speed to 20km. We have not tested how far that final 15% will take you. 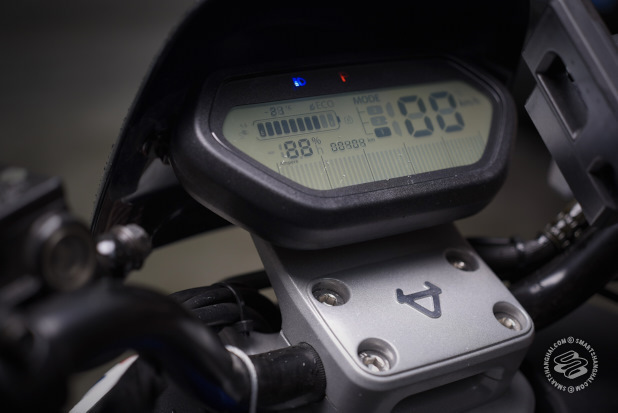 At 2500rmb, the Panasonic lithium-ion battery is the most expensive part of the bike. 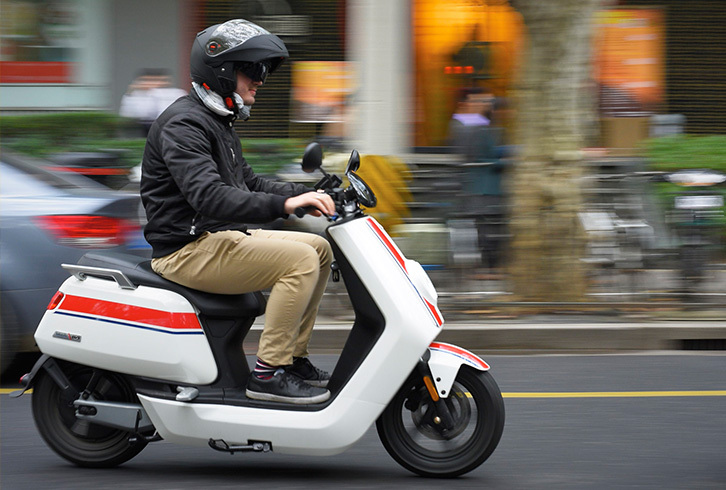 Most scooter batteries in China are clunky, lead-acid bricks. Lithium-ion batteries are lighter, more environmentally friendly, and last longer. The Niu also comes with a portable battery charger, so you can just bring it inside and charge it at your desk while you work. Update: As for battery security, the battery is locked under the footboard, and the lock for that compartment is under the seat. Someone with a crowbar will still get this battery out if they want, but the battery is light enough to carry if you're worried. Acceleration: Really nimble Bosch motor, which gives you a big advantage in Shanghai traffic. Like, if you pull the throttle all the way, you'll launch forward. This is the most impressive aspect of the N1. Of course, it can't compare to a motorcycle, but certainly much, much quicker than other scooters in this price range. Handling: The suspension is a little stiff, which means better handling, but you will definitely feel the bumps in the road. You can lean into corners a bit. Somewhat related, the seating position on this bike is not so comfortable for long rides. Brakes: Good. Big disc breaks, high-quality tires. Performing well even in the rain. App Integration: Niu has a proprietary, Chinese-language only app for Android and iPhone. This app can show you the location of your bike via GPS, show your last route (if you haven't shut the bike off yet), display how much battery life you have left and how far that will take you (again, not accounting for driving style, so not accurate), link you with repair shops, and send you notifications when the battery is removed or the wheels move. The app cannot disable the bike remotely if someone steals it. This has been a standard feature on Apple products for years now, and it's too bad Niu didn't include that, as this bike is candy for thieves. Also, somewhat annoyingly, the Niu app will sometimes send notifications, in Chinese, to tell you "tomorrow, it's going to be cloudy", which can confuse and worry people who cannot read Chinese. Build Quality: Similar to other, cheaper scooters. Ironically, the build is the weakest part of "The Bull". The plastic on parts like fenders and the seat feels especially flimsy. Aleksander says, "with my driving style…next year, I'll probably buy the second edition of this. I don't believe this scooter is gonna last that many years." One of our staff got a little overzealous with the throttle, hit a wall, and cracked the fender. Note: We've only tested this bike for three weeks. We'll update this article sometime in the next few months with more details on build-quality and durability. 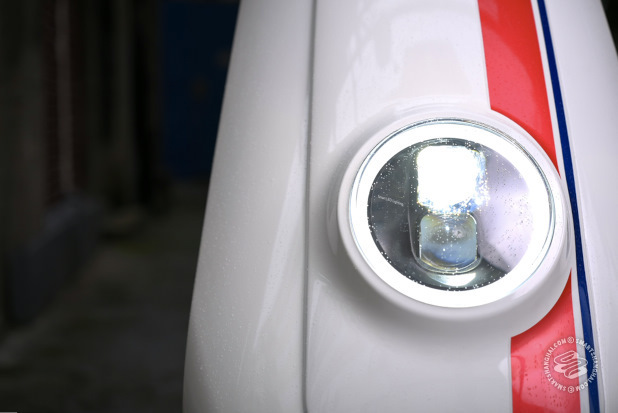 - Big, bright LED headlight, with high-beams and a few different settings. Rear lights and turn signals are really obvious too. - USB charging, so you can plug in your phone or whatever. - A nice little hook to hang your groceries from. - The battery is lithium-ion, not lead-acid like a lot of e-bikes here. - Transponder keys with lock, unlock, and alarm-arm. There's a button that will help you locate you bike, too. Do you have health insurance? There's a saying in Chinese, "肉包铁，铁包肉" (Flesh protects steel (bike); steel protects flesh (car)". If you're someone who needs to move around the city frequently and can't be late, like a photographer, the Niu N1 is definitely a strong look. Despite the less-than-stellar build quality, Aleksander is super happy with the bike. The acceleration really helps when getting around traffic in rush hour, and the bike feels sturdy. The only question is, how long can it last? If you're in the market for a scooter and money is not a huge concern, we recommend it. It may cost 5000rmb, but if you spend 100rmb a week on a taxi, well, there you go. 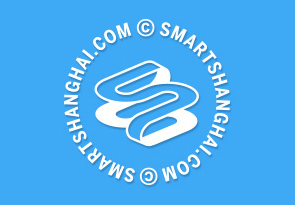 Lord knows Shanghai has enough cars, so hopefully Li's plan to make scooters cool to the middle class works. Within 20-30 years, all the cars and trucks on the street will be self-driven Apple and Amazon machines anyway, leaving just e-bikes and bicycles piloted by humans. They have two versions. 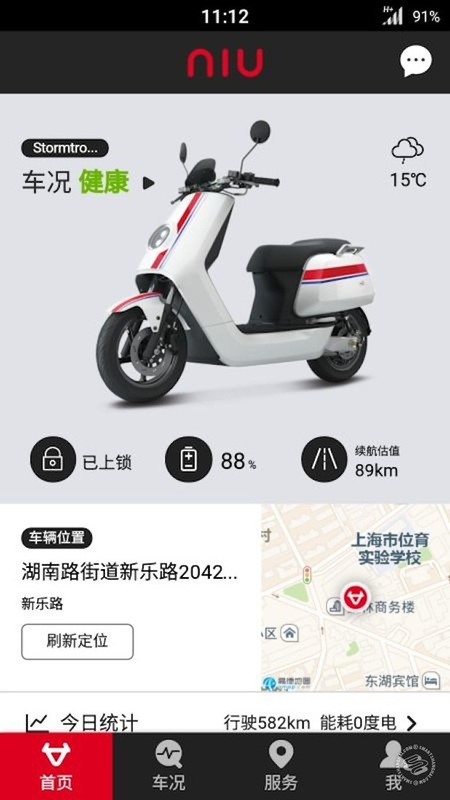 The Urban Edition (3999rmb) can go 80km on a single charge, and has an 800 watt battery. This article focuses on the Hybrid Edition (4999rmb), whose 1200w battery can push it for 100km before recharging. They also claim that the Hybrid edition performs better traveling uphill. Now, getting ahold of the Niu N1, right now anyway, is a little tricky. The official Niu website claims to be sold out. When we called, they said they didn't know how long it would take, and encouraged us to report any offline shops selling the bikes, but you can buy one around town for a slightly inflated price. Aleksander opted to pay 5800rmb for his, rather than wait. ...or you could just wait for the Harley E-Bike to come out. If you're looking for a scooter, or want to get rid of yours, check our buy & sell section. It's free. Is there any security, like a lock, not the app notification, for that very expensive battery? I'm sure I'm not alone in having had a battery stolen from my bike. @Wave Manipulator, good point. Updated the article above, too, but the battery is in a compartment under the footboard. To unlock that compartment, you'll need to unlock the seat cover, then unlock another lock in there. Still, if someone wants that battery, they'll get it (could probably bust open the footboard with a crowbar). Luckily, a 10kg battery is not too bad to carry around, or at least carry into the office / club locker. Is it possible to be 2 person on the seat (even if the law forbid it)? The handle on the rear seat seems quite high. no? @visionrouge, yes it's quite comfortable with two peeps. The driver and myself are both around 90kg and we fit on this fine. The rear foot rests are well-positioned. This bike has not been out for a few months, they have been on sale for at least a good 6 months, ive seen quite a few of them running around in summer. Second you can get them off taobao in Shanghai, 5500rmb, then you can collect in person from the store (way out in songjiang) or they can deliver it to your home. Great ebike though, you can buy something faster and cheaper by opting for a 1500w or 2000w lead acid battery powered bike. But it wont look or feel as premium as this bike. Compared to the other electric bikes it does feel premium and yeh its a great looking bike. I have been considering getting one but it wasn't long ago I bought a bike brand new. Nice review though, thanks for the info. From what my friend told me they go a little faster than regular 60v bikes that most laowai are riding around town. Would like to know the red and blue stripes were put on by your photographer himself? because from the ad and the website it looks totally white and a little bit ....plain. I am seriously considering buy a new scooter. Hello, what about how to register the NIU ? Yes I was also going to mention this, you really should have mentioned this Ian. 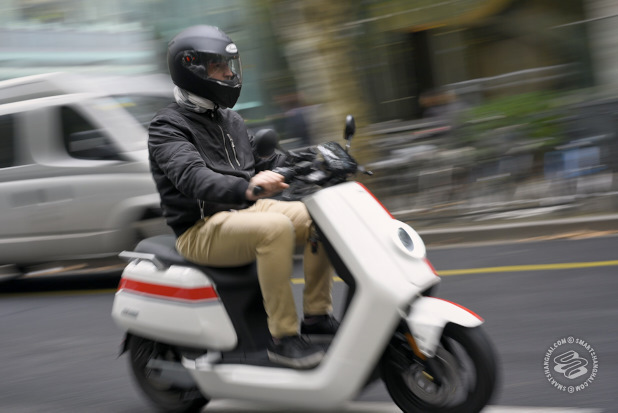 The scooter can be registered legally at your local traffic police station and they are FULLY LEGAL for the foreseeable future. As oppose to the larger electric bikes that don't have pedals and 90% of foreigners here are riding them. Those ones will be illegal after march 2017, the ones with the blue tag temporary registration. @jtf87 : Really ? Did you get yours registered ? Or do you have some source ? Bcs this is THE thing which stop me from buying one. Don't want to buy online. Where is there a store that has some in stock? Hello guys, Just got N1s Sport, I was wondering I cannot go more than 20Km/h, and when I reach that speed the eco mode comes on automatically , I was wondering how can I get rid of that, and I'm going everywhere in 3rd gear which I assume is sport mode! Kindly advise if you have any info to how I'm able to fix this!